Power Pro Beading Thread is made from Spectra, an ultra high molecular weight polyethylene. Spectra by Honeywell in the USA. The Power Pro Spectra fibers are braided, then coated with a thermally applied bond. 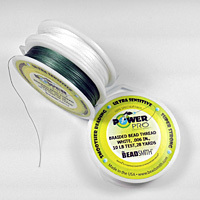 The thread has very little stretch and a slithly textured feel as the texture of the braid is felt through the bond. Most beads will not cut the thread, so it works a bit like a wire, but behaves more like a thread. It can be knotted and is not easily pierced by a needle. It is waterproof, colorfast. The actual fiber are white and cannot be dyed. For Moss Green, the bond is green over white fibers. The thread can be melted with a thread burner.